Wow. I loved this book so, so much (if you couldn't tell by the five stars). As a fan of usually heavier fiction of a darker nature, I did not expect to fall so abundantly in love with this story and these characters. This is more than just a "fun" read. Yes, it's funny (very funny) but it's also thoughtful and reflective. The story is based around Lily and Dash and a notebook that they exclusively communicate through, leaving each other dares, clues and diary entries. The story picks up immediately when Dash finds the mysterious journal and it's clues on page one. The novel is written in alternating chapters of first person either from Lily or Dash. 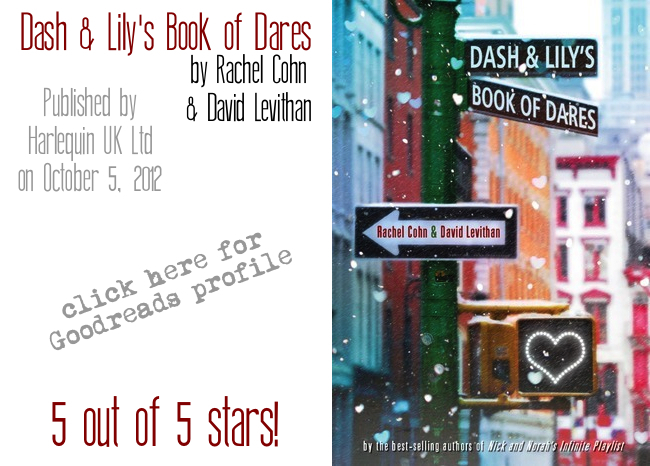 As you probably guessed, Dash is written by David Levithan and Lily by Rachel Cohn. Whereas you might think this would be confusing or tiresome, I assure you, it is not. In fact, I found the nature of this storytelling so natural, at times I forgot I was reading and that these people were fictional. * It is so funny. * The characters are unique, lovable, in-depth, flawed. * I love that the plot and character development is interwoven through out the novel, and you know that everything you are reading has a purpose in the story. * The plot is unpredictable and genuinely enjoyable. One of the greatest things about this story is, like I said, it's more than just fun and quirky. It has a true sincerity that is constantly touching on the characters' struggles with love, happiness and teenage existence all-together. This is one of the most enjoyable reads I've encountered in a long time. It wasn't nail-biting suspense, but pure literary companionship. This is the first book I can say I cannot wait to read again. I love Rachel's books I read Cupcake, Shrimp and Gingerbread and the book and Naomi and Ely's No Kiss List from her and David. Really great stuff :) I'll have to check this out! Can't wait to read this book in December! Literally have been saving it for 12 months. I'm so excited. oh my gosh, this sounds fantastic. I cannot wait to read this. I'm growing quite a list!! !